Water and fire are two words that have never gone together. The True Utility FireStash changes everything. If you get a standard lighter wet and you need to use it right then, you’ve lost your fire. If its rained all night and your matches have been soaked through you won’t be able to use them until hours later hoping to dry them out. 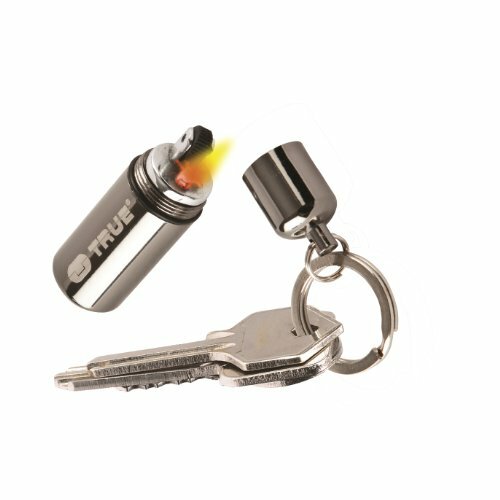 This miniature waterproof lighter fits alongside your keys whilst maintaining a flame that will always be there for you, rain or shine. This petrol lighter is refillable and the same size as your door key at only 45mm long. It is essential for any outdoor activity as the waterproof neoprene ‘O’ ring makes sure water will never put your flame out. It has an extendable wick within its unbelievably small dark chrome zinc alloy casing, making it an amazing key ring accessory as well as purposeful one. It comes with a 20mm split key ring attachment so you can put it on your keys or attach it to your belt. Wherever you put it with the FireStash you’ll always have a lighter that is ready and prepared for anything. This True Utility product is now packed in a weatherproof Hard Case which has been designed to be perfect for storing all the items you want to keep safe. Measuring just 120mm long, you can fit in the things you need whilst still fitting it in your pocket. Retailing for an RRP of £3.99 alone it is a product in itself offering great value for money from your True Utility purchase. Most mobile phones fit allowing you piece of mind when you are out exploring or on the beach. Money and matches will remain dry in this splashproof container. Personal cameras, credit cards, and most GPS systems will also fit neatly inside. Made from 1.8mm thick the plastic container is strong enough to withstand your travels whilst being thin enough to not get in the way. Weighing only 59g it won’t hold you down or be considered an extra weight amongst your kit. The black clip is designed to easy to open with just one hand quickly and efficiently so you can get your belongings out whenever you need them. Please note: this container is not waterproof but it is most definitely – sandproof, splashproof, weatherproof, windproof and snowproof. Perfect for all of your outdoor needs.